- located at 115 N Madison Ave, is owned by the Webb City Historical Society. Two rooms on the first floor, one large room on the second floor and a commercial kitchen are available for rent. Each first floor room is large enough to seat up to 35 people. The rental rate is $40 for one first floor room, $70 for two first floor rooms and $150 for the first and second floor rooms. Rentals are per day from 9 a.m. to midnight. The newly renovated building was originally built as the Clubhouse for the employees of the Southwest Missouri Electric Railroad. This is the perfect place for small gatherings and larger receptions in an historic setting. For reservation information, contact Eileen Nichols at 673-5866 or 417-483-8139. The Mining Days Community Building - Located in King Jack Park is ideal for larger gatherings with seating for over 100 diners. The newly constructed facility boasts a commercial kitchen, a meeting area of 2,400 square feet, and expansive views of the park. For reservation and fee information, contact 673-4651. The Amphitheater - Located adjacent to the Mining Days Community Building and features a covered raised stage. Seating for 350 can be expanded to 650 by using the lawns. For reservation and fee information, contact 673-4651. 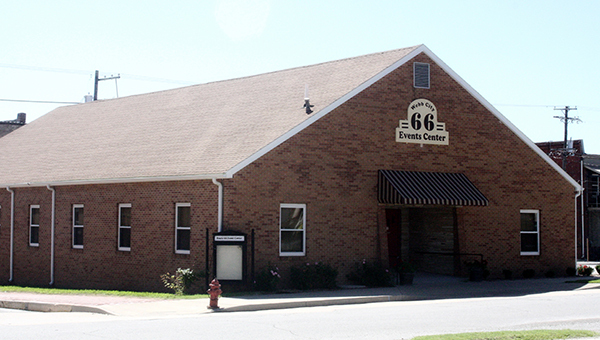 Route 66 Events Center, 21 S Webb, can seat up to 150 diners and 300 theater style. For reservation and fee information contact 673-4651. Webb City Senior Center - 210 Pennsylvania Ave., can seat up to 125 persons in its newly remodeled dining room. For rental costs and more information, contact 673-1876. Granny Shaffer’s Restaurant – at 2728 N. Range Line, has three rooms available for private use. The Route 66 room seats up to 20 people. Granny’s Parlor seats up to 45. The Trolley Room seats up to 125. There is no room rental charge for the rooms if meals are ordered through the restaurant. For information, contact Mike Wiggins at 659-9393.
information, contact Mike Wiggins at 659-9393.